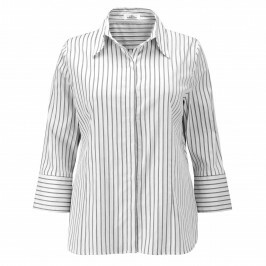 If you love shirts, this piece from Karin will become a favourite in your wardrobe. The fabric is soft and stretchy so you can wear it all day long without feeling uncomfortable. Great for the office, wear this 3/4 sleeves style as a layering piece under the season's knits for a more relaxed look. Narrow blue stripes on white shirt. 3/4 sleeves with cuffs that can be turned up. 57% Cotton, 24% Polyamide, 15% Polyester, 4% Elastane. Delicate Machine Wash.